I know this seems like a random CGB post. This movie isn’t in theaters anymore and I didn’t even announce that I’d be reviewing this movie on the CGB Facebook page. However, there is an explanation as to why I’m reviewing this today. On Friday, I wrote my first article for The Catholic Response. It was an op-ed about Kim Davis, the Kentucky County Clerk who refused to issue marriage licenses to both homosexual and heterosexual couples. When I posted the article on my personal FB page, it didn’t take long for a war to break out in the comments section between my conservative friends and my liberal friends. Anywho, playing defense for two days wore me out, so I thought I’d do a more light-hearted post. This is my review of Guardians of the Galaxy! Guardians of the Galaxy is the movie that had Marvel Studios bitting their nails. Based on an obscure series of comics, Guardians of the Galaxy tells the story of Peter Quill, aka Starlord, a fast-talking, brash space collector who ends up coming across three misfits; an alien named Gamora and two genetically engineered creatures, Rocket the racoon and his tree hybrid friend, Groot. The four of them are taken into custody after a brief quarrel with one another and meet another outcast named Drax. From there, this ragtag group must come together to save the world. I’ve seen this movie four times and it wasn’t until my fourth viewing when I finally gave in to the film’s charms and embraced it as my favorite Marvel movie. This is the ultimate popcorn flick! I have always had a soft spot for stories about a group of oddball people who have to set aside their differences and stick together. The five leads are well-established and identifiable not just because of their unique designs, but also because of their personalities and backstories. Peter/Starlord, Gamora, Drax, Rocket and Groot are all fleshed-out characters and never come across as cliched tropes. I LOVE Rocket and Groot! Rocket is hilarious with his sardonic humor and quips. Groot is just charming with his humility and classic line, “I am Groot.” I appreciate how his one line never becomes annoying. It’s made clear that he has a limited vocabulary through no fault of his own, so him saying “I am Groot” all the time is understandable. 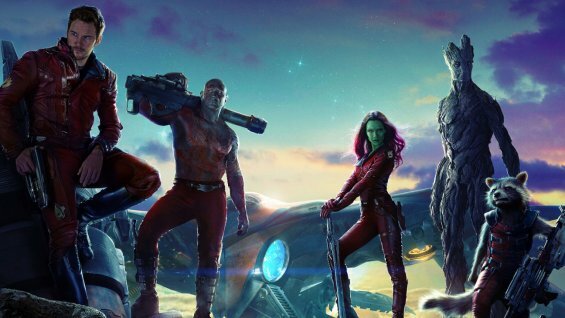 Guardians of the Galaxy does what Fant4stic Four couldn’t achieve; it establishes Starlord, Gamora, Drax, Rocket and Groot as a family unit. They bicker and argue without bailing on each other. They disagree, but begrugingly come to necessary compromises. There’s a dynamic within the group. They have a rapport with one another. What’s interesting is that the five characters start out using each other, but as a journey goes on, their selfish agendas are gradually replaced with sincere loyalty and a sense that sticking together is essential for their survival. Actually, this movie depicts how everything falls apart when people come together for self-serving reasons, and that the greater good can be accomplished once those same people put aside personal gain. C.S. Lewis once said, “How monotonously alike all the great tyrants and conquerors have been; how gloriously different are the saints.” This movie is a great example of that. The villains, Thanos, Ronan and Nebula have the same demeanor and are all self-centered. Meanwhile, Starlord, Gamora, Drax, Rocket and Groot all have distinct personalities and different backstories, yet come together for the same cause. Yes, I love the Guardians of the Galaxy soundtrack. I’ve listen to “Hooked on a Feeling,” “Cherry Bomb” and “Come and Get Your Love” about a dozen times. Making Peter Quill/Starlord a lover of 80’s rock music was a brilliant way to incorporate the songs into the film. Why did it take four viewings for me to like Guardians of the Galaxy? Well, for one, you almost have to watch it a second time because the plot gets convoluted, especially with its space talk and technobabble. I found myself caring more about the characters than the actual conflict. Despite all the emphasis placed on the Inifinity Stone thingamajig, the object itself doesn’t have much presence. I kept forgetting that the Infinity Stone was even a thing unless characters brought it up via expositional dialogue. Am I the only one getting sick of weak villains? I understand that no one is born evil, but come on, screenwriters, step up your game when it comes to writing villains! Mind you, the MCU (Marvel Cinematic Universe) is handled by the same people who gave us the entertaining, yet intimidating Loki (Thor’s brother). Loki is the best comedic villain that I’ve seen in a while, so I know that Marvel Studios is capable of bringing great villains to the big screen. As for Guardians, Ronan the Accuser is the reason why I didn’t care for the story’s conflict. The script tries to make him a narrow-minded traditionalist, but that arch goes nowhere. His rivalry with Thanos is partially realized. Two villains who don’t like each other is an interesting concept, but the movie doesn’t execute it very well. Ronan himself is just not very interesting. His design is passable and the actor portraying him is fine, but the character never frightened me. How am I supposed to be concerned about the safety of the protagonist(s) if the villain isn’t an intimidating threat? Finally, there is one thing I should mention. The movie opens with a hospital scene in which young Peter Quill says good-bye to his dying mother. This scene might be uncomfortable for those who have lost a family member (specifically a mother or grandmother) recently. The scene is only a few minutes long, but I thought I’d give you all a heads-up. Honestly, I love this movie because of the five titular Guardians. Their evolution from selfish outcasts to a family unit that would go through Hell and back for each other is executed wonderfully. Other than the heartwrenching opening scene, the majority of the movie is an exciting action comedy with heart and humor. Saint Ignatius of Loyala, pray for us.